Something blue? Check. Sparkly? Check. Super Comfy? Double-check. Recently, I've been seening a lot of our Disney brides sporting TOMS Glitters as their something blue for the reception- and I couldn't love this trend more if I tried! I'm all about splurging for a killer pair of ceremony shoes, but there is nothing better than knowing you can dance the night away in a nice pair of flats after you say "I do". Plus, for every pair you purchase TOMS donates a pair of shoes to a child in need. 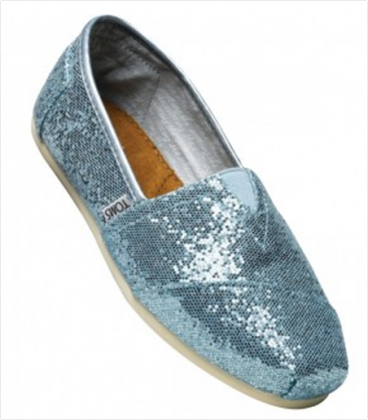 Do I have any TOMS fans out there? If you've got a story, I want to hear it!